Published by Jefferson's Printing and Stationary Co., 1931. Covers are worn, spine is cracked and loose. Inside pages are nice and clean. Title page and first 48 pages of introductory material and index to advertisers is missing, this does not affect any directory pages of the residential listings. 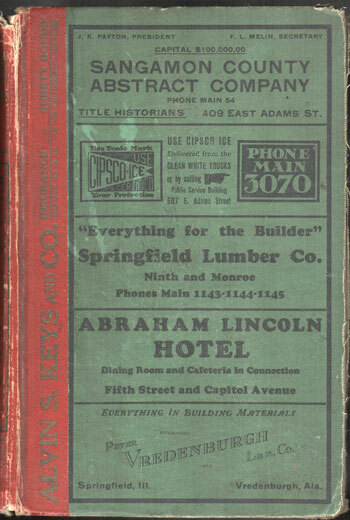 An extensive directory of the residents of Springfield, Illinois in 1931. Each listing includes the name, address, and in many cases the occupation and the name of the spouse. Hard cover, 1,146 pages with tens of thousands of names and addresses; a valuable resource for genealogy or historical research.